Residential Project Ansal Royal Heritage by Ansal Buildwell Group is a Residential Property of luxurious apartment situated in Sector 70, Faridabad. It is a well developed locality with all kind of facilities and modern features. These residential apartments are designed as per the architectural styles of Maharaja with all kind of ultra modern amenities providing comfort to the residents. 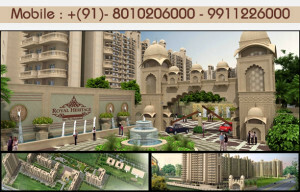 The Ansal Royal Heritage apartments in Faridabad are available in 2 BHK, 2+1 BHK, 3 BHK and 3+1 BHK units. This residential project is built to the theme of Heritage. Earthquake resistant RCC framed structure offering safe life style. Ansal Royal Heritage Apartments– A project giving you a really royal feel of living. It is a combination of a beauty and decency together with the lavish way of living. Enjoy the beautifully designed open spaces with water bodies and fountains.